A great feature of the client portal is the option for your clients to fill out and sign intake forms electronically online. You will need to be a Organization Administrator for your TheraNest account to access the Client Portal settings, like Intake Forms. TheraNest provides three intake forms by default. 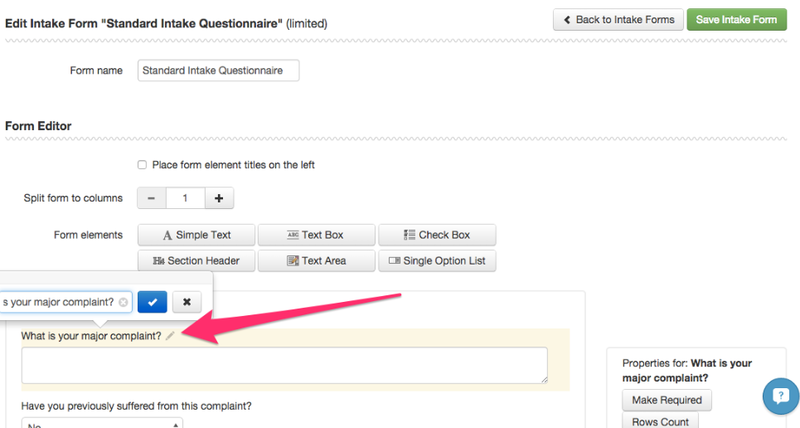 You can adjust the forms by clicking Edit in the Actions column. Add additional fields by clicking the button corresponding to the field you would like to add. Edit the titles of each filed by clicking the title, adjusting the text, click the checkmark to the right and save the form. The style elements in the Intake Form editor are the same as a Custom Form. To learn about those elements and more click here. You can disable a form by clicking No under the Send to Client column. The forms that are marked "Yes" will be seen automatically by clients who use the New Invitation Link to signup to create their portal. You can choose which forms clients receive when you invite them to the portal using the Manage Clients section. Use the Change Order column to setup the order that the client will complete the intake forms. For example, if you want the client to read Notice of Privacy Practices before completing Intake Questionnaire. After you have finished editing the form click Save at the top or bottom of the form. You can also create your own Intake Form from scratch by clicking + New Intake Form. All staff members assigned to the client will receive an email after the intake forms are submitted. You can see if your clients have successfully submitted intake forms from the Client Form Status column located in the Manage Clients section of the Client Portal Settings. Submitted Intake Forms will appear in the client's General Documents tab within the Details/demographic area of their profile. You can manage the documents sent to the client from the bottom of the General Documents page in the Shared Forms section; track the status of forms sent, resend and revoke forms, as well as share new forms not previously sent. When your client creates an account in the client portal they will receive a notification about completing intake forms. We created this article to walk your clients through completing forms in their client portal account.